Reading this review will spoil this movie severely! Watch & enjoy the movie first... the choice to believe is yours. I was quite intrigued when I read the blurb about this movie, more so when actress Milla Jovovich introduced the movie as herself, explaining that the choice is yours to believe the “actual” accounts of alien abduction which this movie is based on. To cement her statement even more, she adds that what we’re about to see is extremely disturbing and through some careful Hollywood trickery, I was caught... hook, line and sinker. With that said, The Fourth Kind is a very well made movie that uses every trick in the book to make the viewer believe and like Blair Witch or Paranormal Activity, the movie uses handheld cameras or “archival footage” that like a comic book puts the new footage next to the old to lend credibility to the story. As I watched the movie, not knowing what to expect or was this real? I was left flabbergasted at the end and my brain was unable to comprehend what I just saw... was it real? Surely not because I’ve never heard anything about it. But then again, the archival footage is quite frightening at times which did send chills up my spine and almost looked real. However as Google is my friend, I found a few clues to the validity of the story such as one Charlotte Milchard. However like Milla Jovovich said, the choice is yours to believe but even so, this is one psychological ride that I thoroughly enjoyed. The story focuses on the last stage of alien sightings which is “The Fourth Kind” that is a physical meeting between man and alien, more specifically with abductions. The central character in the film is Dr. Abbey Tyler (Jovovich), a psychologist who is based in the remote Alaskan town of Nome. Unfortunately for Tyler, her husband Will was violently killed but rather than get lost in her mourning, she continues to counsel the town residents until an alarming theme is discovered. 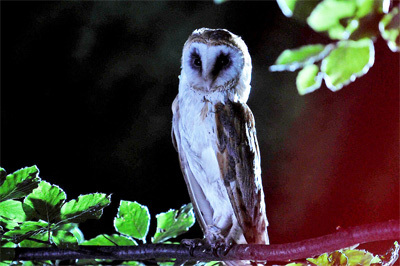 It appears that the majority of people she counsels, all see a white owl at night and when two of her clients are hypnotised to learn more, it seems that alien abduction is the most logical possibility, even for this scientist. This causes a chain reaction in the town, especially with the Sheriff (Will Patton) who believes that Tyler’s tampering with hypnosis is the cause of this evil. However through the persistence of Tyler, we learn that she herself was abducted by these demonic sounding aliens. This is where the movie becomes a true mind #$@! which will leave you questioning the validity of it all but ironically it works perfectly. To compliment the wonderful directing by Olatunde Osunsanmi who really knows how to pull on your heartstrings, the musical score only compels the story even more, thanks to Atli Örvasson which will have you on the edge of your seats. As mentioned in another great movie "The greatest trick the Devil ever pulled was convincing the world he didn't exist" and Osunsanmi should be commended in merging the so called video evidence, interviews and audio to create a very powerful and almost faux documentary. On Blu-ray, The Fourth Kind looks brilliant with realistic skin tones, larger than life colours and image quality that could be considered reference material. What makes the Blu-ray video stand out even more is the merging of archival footage with the actual movie that is 1080p. The contrast only highlights the powerful story even more and it also boasts some cinematography to die for. Add in some great use of surround sound it had me jumping out of my chair on more than one occasion which is just another cool trick that the director uses… bravo… bravo indeed! The only problem with the Fourth Kind is the lack of extras whatsoever! Nothing! Zippo! Nada! I was hoping to see more “archival” footage of Dr. Tyler’s interview or the making of this clever ruse. However, even though I went into this movie blind, I was pleasantly surprised and The Fourth Kind took me on a very memorable and creative ride about aliens and the like.